I stumbled upon this article last year. And then again a week ago. It’s by artist and illustrator Yumi Sakugawa. was her Asian American role model growing up in the states. 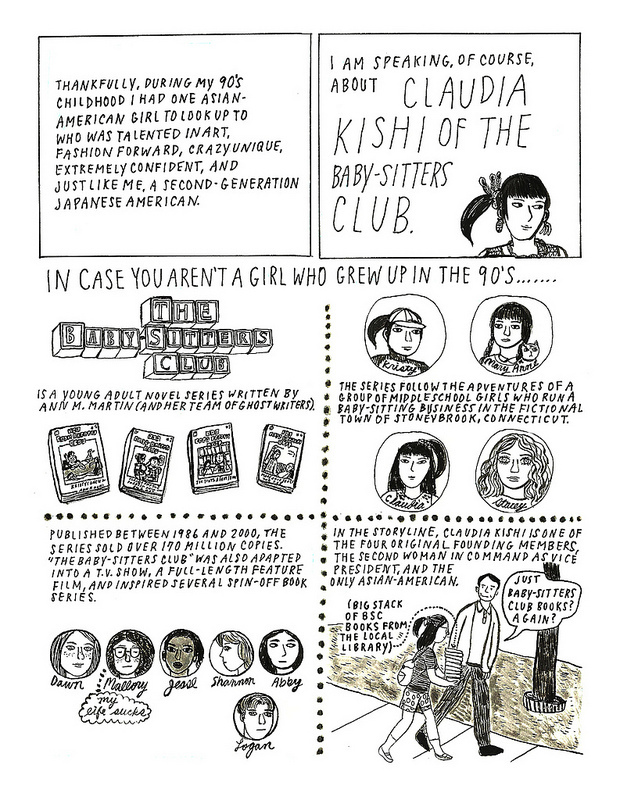 The Baby-sitters Club was one of my favorite series to read in grade school. it was really interesting to read this comic article she wrote. have a lot of famous Asian role models back then. And for some reason Shannon Doherty. so I can’t really say if things have changed. But I’m hoping more Asians are getting out there. 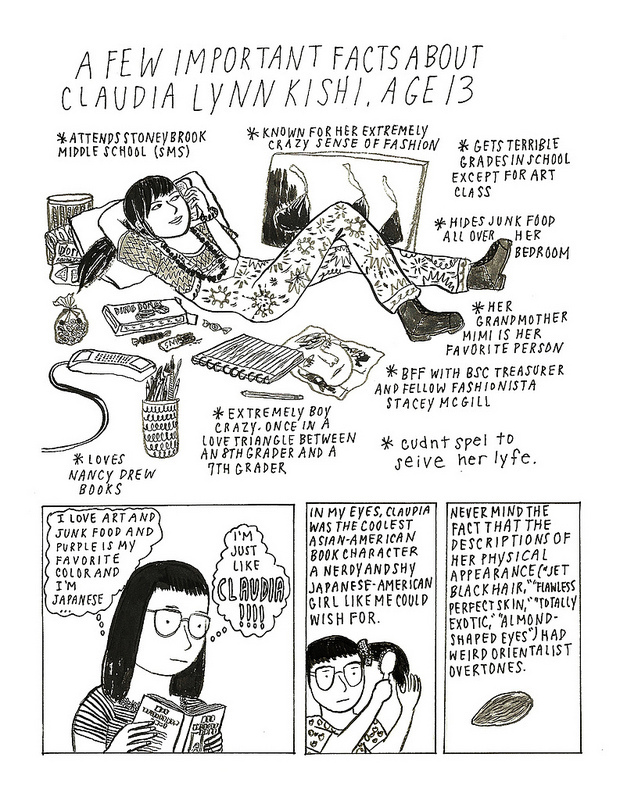 Super cool and creative like Claudia Kishi. Or maybe super cool and creative like Yumi Sakugawa. 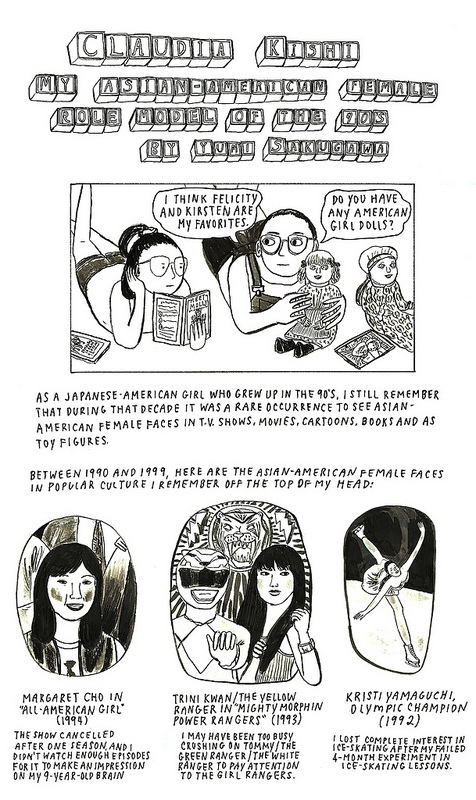 There is a chance the 13-year-old Claudia Kishi will become MY role model. It really is time I started to act more mature and older than I do, closer to her age way back when. There were a few Japanese students in my elementary-school classes. Laura Tokunaga was the prettiest in the class. Robert Oshita and I hung around for a while. My foolishness and immaturity may have been a turn off or we just went to different classes. But, actually, I think he moved, as a lot of people do here. Later I moved to an area that was a little Japanese enclave. They even had a Japanese market. I still have the Japanese vegetable knife I bought there in the early 70s after I got the vegetarian cookbook Tassajara Cooking which has a new version here. Not to have access to a place like that must have been tough. One thing that saddened me when I saw it here in the states is how minority kids sometimes take to heart the ridiculous and ignorant stereotypes of minorities that are foisted on them by the mainstream. It is good to be able to find good role models. You rock Claudia Kishi! Japan is not totally innocent either. I couldn’t count how many restaurants I was forbidden entrance to because I was not Japanese. Also big problems with real estate agencies and potential landlords　外人不可とか‥. Not to mention the, “Japan is for Japanese. Go back to your own country.” Just out of curiosity, what is the attitude toward non-Japanese people held by your real estate company employers? I just looked at some photos of Shannon Doherty. Dark hair, high cheekbones. Asian eyes that look like they could even have epicanthal folds. An easy misunderstanding. Doherty is an Irish name. Irish people are Eurasian. They originated far to the east of where they are now. I have seen a number of asian eyes and features on various Irish and other Celtic people. Thanks for this. I never knew of the Baby-sitters Club. But then I was out of the states during the 90s—in a place that for many reasons I liked a lot better. Still do. I don't think restaurants forbid foreigners these days…or at least not in Tokyo. The real estate thing is a touchy subject. I've heard a lot of owners don't want foreigners in their apartments because they've had bad experiences. Everything from trash to moving out without notice. And it makes them weary. But it's sad because those few kind of ruin it for the rest of the foreigners. Also the language barrier can be a problem. Landlords like to be able to communicate with the tenants. My foreign friends who speak Japanese always have an easier time finding apartments. I can't really say for my company as we don't rent, just sell. But any foreigner with a job at a company that will sponsor them shouldn't have that much of a problem finding a place in Tokyo these days!